In the city government consolidation of 1913, the City of South Norwalk became the Second Taxing District, but South Norwalk was brought into the consolidation against its will. South Norwalk had been incorporated in 1873 as a city within the Town of Norwalk and in the following half-century it became the economic center of Norwalk. With a port and a railroad, it was the center of Norwalk industry, providing employment to thousands of Norwalk factory workers. Prosperous and self-sufficient, the City of South Norwalk had little financial incentive to join in the 1913 consolidation. Its residents feared higher taxes if they lost their city status. In 1902 South Norwalk had tried to leave the Town of Norwalk entirely, and, along with East Norwalk, become a completely separate Town. At the time Mayor Mortimer M. Lee said that South Norwalk had “a large water system, a splendid electric light plant, a separate sewer system, a public library and a library building and schools second to none.” In 1903 the Connecticut State legislature passed a bill to create the independent Town of South Norwalk, but it was vetoed by the governor. With many of its citizens dreaming of independence, there was little support in South Norwalk for the 1913 consolidation proposal and the referendum on consolidation was soundly defeated in South Norwalk. However South Norwalk was outvoted by the rest of the town, and the consolidation became law. South Norwalk ceased to be a city and became the Second Taxing District of the new City of Norwalk. But South Norwalk’s local interests were strong, and the compromises that had been needed to forge a charter led to South Norwalk retaining much of the infrastructure of a city. It was justly proud of its modern electric works and water department, and of its Carnegie library building, newly opened in 1913. East Washington Street, looking west, about 1909. Until the middle of the twentieth century the Second Taxing District remained prosperous, but by the 1950s many of the old factories of Norwalk were going out of business. 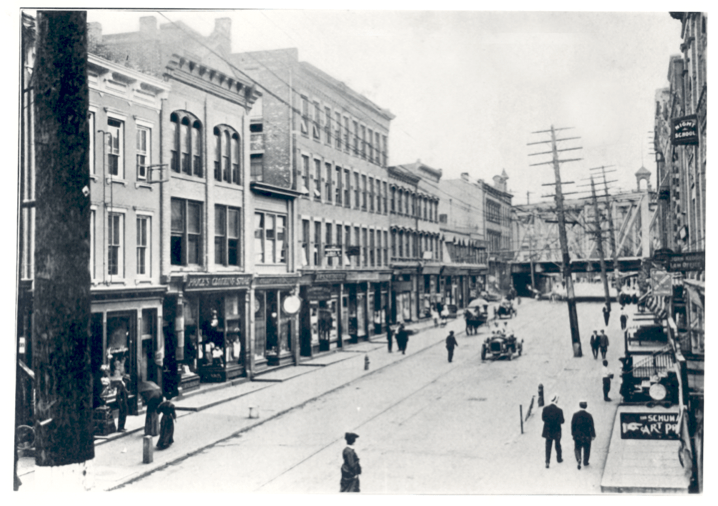 Hats, Norwalk’s major industry, were no longer fashionable, and industrial production was shifting away from New England to other states with cheaper labor costs. The effects of this were felt most strongly in South Norwalk, which had been the industrial heart of Norwalk. The decline of the old factories and buildings in South Norwalk led to urban renewal in the 1960s, with a large area around West Washington Street being demolished and replaced with offices, a shopping center, and low-cost housing. In the 1970s the Norwalk Redevelopment Agency turned its attention to the neglected buildings of East Washington Street, with plans to demolish much of the block between the Norwalk River and Main St. But this time many residents fought to save the buildings. As a result, in 1977 all of East Washington Street, the adjacent buildings on the northeast side of South Main Street, and the railroad bridge across Washington Street were put on the National Register of Historic Places. These distinctive city buildings were saved. The National Register application pointed out that “the buildings remain as products of the vital, expansive and diverse economy of the period 1870-1920”. The heart of South Norwalk was restored, and the street became a shopping and restaurant center for a revitalized South Norwalk. In 1988 the Maritime Aquarium was opened in South Norwalk, in what had been an old factory building. Out of its industrial past the area was reborn as a regional tourist center. Throughout these changes the Second Taxing District Commissioners continued to provide local utilities to the area, and to support the growth of South Norwalk.